Today’s F1 hybrid cars are based on very similar power units made up of about the same internal combustion engine (ICE) and energy recovery system (ERS). Because of restrictive design rules permitting too much fuel per race, the internal combustion engine is not particularly fuel efficient. The methodology is based on lap time simulations and telemetry data for a F1 H car covering one lap of the Monaco Grand Prix. The methodology is based on lap time simulations and telemetry data for a F1 H car covering one lap of the Monaco Grand Prix. The present limit of 100 kg of fuel per race is excessive. The low power energy recovery system is used strategically rather than fuel savings recovering very little braking energy. The 4 MJ of storable energy is used only when it is strategically needed. The 2 MJ of recoverable energy allowed per lap are almost never collected. To return to be technically attractive, F1 should permit much more freedom in the definition of the ICE and the ERS. As the goal of the rules should be lowering the fuel consumption while keeping technical and sporting interest high, the best solution is more freedom to achieve the fastest car within more stringent limits of fuel economy. A real limit to the total fuel consumption for a race track like Monte Carlo should be not more than 80 kg of fuel. This would translate in more energy recovery to the ERS per lap and better fuel efficiency of the ICE and will certainly help more the design of passenger cars. A. Boretti, Kinetic energy recovery systems for racing cars, Pennsylvania: Society of Automotive Engineering (SAE) International, 2013. A. Boretti, “KERS braking for 2014 F1 cars,” Society of Automotive Engineering (SAE) Technical Paper 2012-01-1802, September 17, 2012. A. Boretti, “F1 2014: turbocharged and downsized ICE and KERS boost,” World Journal of Modelling and Simulation, vol. 9, no. 2, pp. 150-160, 2013. A. Boretti and I. Aris, “Regenerative braking of a 2015 LMP1-H racing car,” Society of Automotive Engineering (SAE) Technical Paper 2015-01-2659, September 27, 2015. 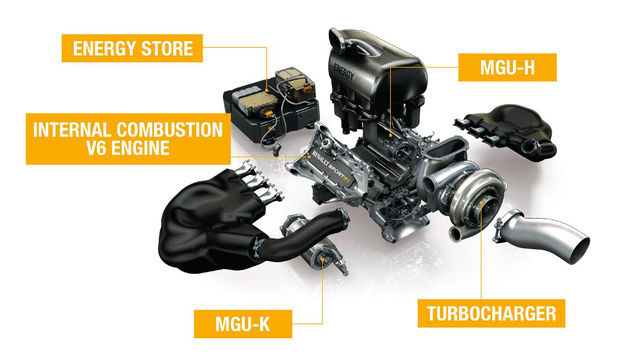 M. Petrány, “How formula one's amazing new hybrid turbo engine works,” http://jalopnik.com/how-formula-ones-amazing-new-hybrid-turbo-engine-works-1506450399, January 22 2014. W. F. Milliken and D. L. Milliken, Race car vehicle dynamics, Pennsylvania: Society of Automotive Engineering (SAE) International, 1995. “OptimumG-vehicle dynamics solutions,” http://www.optimumg.com, 2017. “LapSim-professional racing simulation software,” http://www.lapsim.nl, 2014. M. S. Al Muharrami et al., “Study of open and closed wheels aerodynamic of racing cars in wind tunnels with movable ground at different car speeds,” 18th Australasian Fluid Mechanics Conference, Australia, December 2012. U. Hopmann and M. Algrain “Diesel engine electric turbo compound technology,” Society of Automotive Engineering (SAE) Technical Paper 2003-01-2294, June 23, 2003. F. Millo, F. Mallamo, E. Pautasso and G. Ganio Mego, “The potential of electric exhaust gas turbocharging for HD diesel engines,” Society of Automotive Engineering (SAE) Technical Paper 2006-01-0437, April 3, 2006. S. Ibaraki, Y. Yamashita, K. Sumida, H. Ogita, and Y. Jinnai, “Development of the “hybrid turbo,” an electrically assisted turbocharger,” Mitsubishi Heavy Industries, Ltd. Technical Review, vol. 43, no. 3, September 2006. A. Patterson, R. Tett and J. McGuire, “Exhaust heat recovery using electro-turbogenerators,” Society of Automotive Engineering (SAE) Technical Paper 2009-01-1604, May 13, 2009. T. Katrašnik et al., “An analysis of turbocharged diesel engine dynamic response improvement by electric assisting systems,” Journal of engineering for gas turbines and power, vol. 127, no. 4, pp. 918-926, July 2005. N. Terdich and R. Martinez-Botas, “Experimental efficiency characterization of an electrically assisted turbocharger,” Society of Automotive Engineering (SAE) Technical Paper 2013-24-0122, September 8, 2013. A. Boretti, “Changes of E-KERS Rules to Make F1 More Relevant to Road Cars”, AITI, vol. 3, no. 1, pp. 26-35, Oct. 2017.